A Complete walk-in throughout Campus. * Sibling Subsidy - A 15% Sibling subsidy will be applicable on the tuition fees only. # Sibling Subsidy is not applicable for students of Afternoon session. The school fee for Grade 8, 9, 10, 11 & 12 of IGCSE/AS/A Level will be payable on 3 months basis. Total Registration fee is S$ 2000 (up to Grade 10) is payable in instalments of S$ 500 each academic session. Special ECA activities like - Abacus, Bowling, Swimming, Tennis and Badminton will have additional charges. After two weeks the School reserves the right to initiate appropriate action such as discontinuation of student's studies and/or a penal fine of S$642.00 (incl. of 7% GST). * Late fee payment implies, payment made 1 day after the scheduled due date(s) in Schedule B of Student Contact as late. NOTE: The prevailing Goods and Services Tax (GST @7%) rates is applicable and if GST rate is revised then all fee will be recalculated to reflect the said change. The acceptable mode of payment of fee to the school will be only through GIRO mode. In case a parent chooses to make fee payment through any other mode, the charges will be as under. 1. GIRO - To download GIRO form click here. Please fill up the form and return the original form to the reception. 2. Internet Banking - Please refer to school Almanac for the bank details. An additional $50 will be levied on the school term fee. 3. Cash - No cash payment for Term fee will be accepted by the school except in case of procurement of Uniforms and Stationary. An additional 2% charge will be levied on the school fee if the payment is still opted for by any parent to be made in cash. 4. Nets/Credit Card - 4% additional charges will be levied on the Term fee in case of payment through Nets/Credit cards. 5. Cheque - In case a parent intends to make payment through cheque they are advised to use the CASHIER ORDER option. Fee payment through cheque is not acceptable. 1. School fee for ICSE/ ISC/ GCE-AS/ A Level & IGCSE (Grade 8 upwards) will be payable on three monthly basis and there will be four Terms as mentioned above under Fee Payment Frequency paragraph. 2. The Academic Year for ICSE/ISC will be April to March month of the succeeding year. The Academic Year for FOUNDATION IGCSE Grade 8 will be from April to December of the same year. The Academic Year for IGCSE (Grade 9 upwards) & GCE AS & A Level program will be from January to December of the same year. 4. Sibling Subsidy - A 15% Sibling subsidy will be applicable on the tuition fees for 2nd child and 3rd child. The subsidy does not apply to other school fees. a) NETS payment surcharge - A 4% nets payment surcharge will be applicable on all NETS payments made to school. b) Payments by AMEX - Payments can be made to the school through credit card [only American Express Credit card is accepted] A surcharge of 4% is applicable for the payments made through credit card. 6. Cashier's order/ Bank drafts/ Telegraphic transfer or cheques will be accepted only at the time of admission towards Registration fee, first Term fee etc. and are to be made in favour of "DPS INTERNATIONAL SCHOOL PTE. LTD." and payable in Singapore Dollars. 7. Cash payment is accepted only for sale of books or other stationary items and uniforms/ PE uniforms only. 8. Cheque dishonour shall attract a penalty of S$250 for each instance and school will not accept cheques in future. 9. If your ward acquires Singapore Citizenship before Grade 1 he/she is required to obtain approval from the MOE for continuation of studies with DPS. He/She will be allowed to continue his/her education after MOE approval. 10. 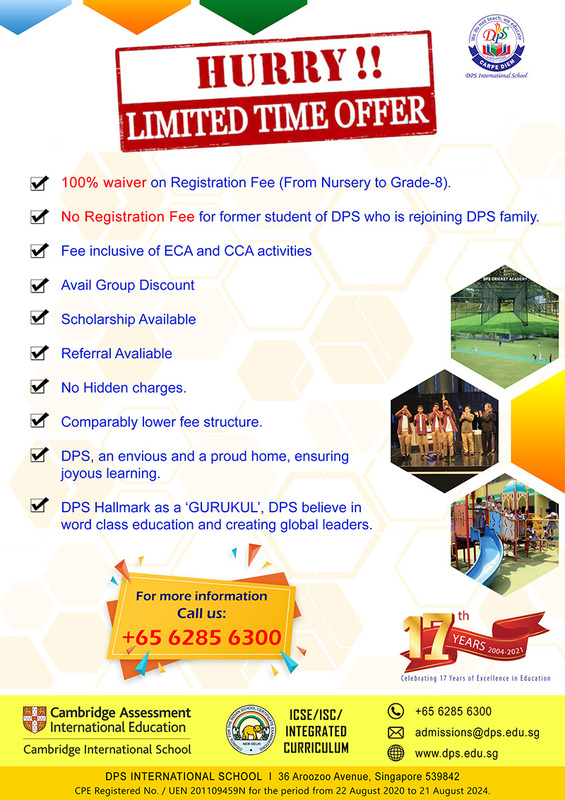 The education facility at DPS International School extends from Nursery to Grade 12. Subject to students performance and other requisites, a student will be deemed to have completed course at DPS on passing the Grade 12. Levels below Grade 12 are of continuous nature and completion of studies at school implies successful completion of Grade 12. 11. All school fees and terms and conditions mentioned above are valid at the time of admission. However, the school reserves the right to make changes to the fee structure, terms & conditions and/or anciliary charges from time to time. See various events, Picnics photos ..
© 2004-2019 DPS International School Pte. Ltd. All rights reserved.